Our fair city has been pretty quiet of late, apart from the unending political jousting and the rising tide of random violent crime. A lot of people try to get out of town during August, when the sidewalks sizzle and the mosquitoes never sleep. Others hunker down and find ways to unwind in situ. For me this means reading even more than usual. Most recently, on the suggestion of a cousin who has spent most of her life living in New York City, I read A Tree Grows In Brooklyn. My cousin was shocked when I told her I’d never read it. I had heard of the book. But in spite of being an English major in college, I somehow never was required to read this particular classic. I realize that picking and choosing required books is a complex business. School administrations have to take into account a lot of cultural and social and political forces when selecting books for public schools. But still. A Tree Grows in Brooklyn was selected as one of the “Books of the Century” by the New York Public Library. Of course that was last century, but having spent a lot of my life in that one I could totally relate to the book which, in case some of you haven’t gotten around to it, is a lovingly detailed yet realistic account of the childhood of an impoverished young girl of Irish heritage in Brooklyn in the early 1900s. Written by Betty Smith, and drawn from her personal experiences growing up in Brooklyn, the story delivers a compelling sense of energy and optimism amid the social problems and prejudices of that particular time. Most of all, Smith creates an emotionally resonant portrait of a family struggling against the odds to achieve even a small portion of the so-called American dream. Young Francie Nolan, the bright plucky heroine, has a big heart and a vivid imagination. She loves to read and cherishes her library card. And one of her favorite places to read is on the fire escape outside her family’s tiny apartment. On a recent visit to New York City I was struck by the beauty of the fire escapes in lower Manhattan. New construction eschews the old exterior stairs that zigzag over the facades of so many old city buildings. And no doubt modern fire prevention systems are more reliable and practical for any number of reasons. 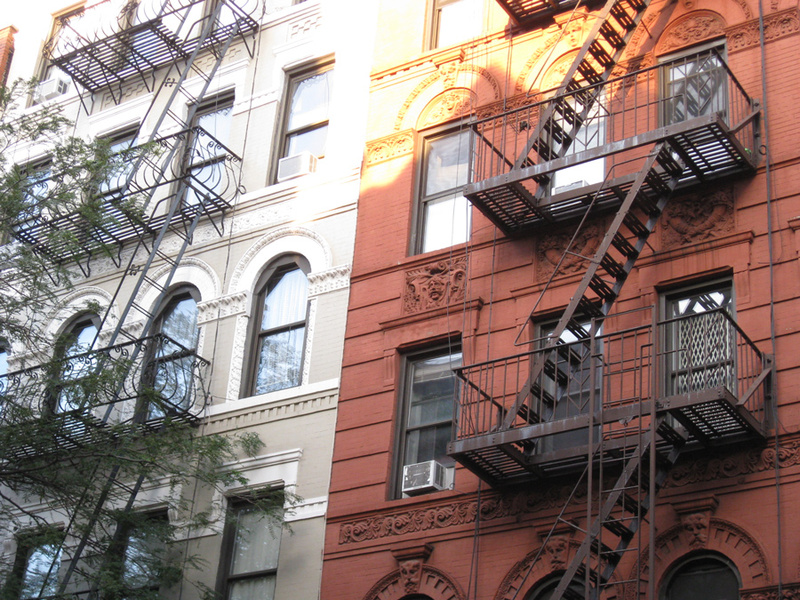 In summertime the old fire escapes serve as a kind of interstitial zone between the public life of the street and the private life inside buildings. Like an urban tree fort with connections to others. Cities work best when the people living in them feel connected in positive ways. When circumstances drive people into hiding something precious is lost. Our modern cities may have outgrown the need for old fashioned fire escapes, but our need for community has never been greater. Spaces that allow people of different social backgrounds to mingle in harmony provide an important part of the process of civilization. A Tree Grows In Brooklyn reminds us that the character of a place plays a big role in the development of personal character. We all need an escape from time to time. But having a place to call home is what keeps us going.